Welcome to the EBS Law Term! Studying a semester abroad can be a life-changing experience! Feel the spirit of an international learning environment and be part of our Law Term. Exclusively made for our international students, the EBS Law Term has an academic focus on Transnational Commercial Law. Upon successful completion the EBS Law Term offers the opportunity to obtain a Certificate in one of the most fascinating business law areas. EBS Law School is located in Wiesbaden in the center of Europe, close to Frankfurt, which makes it the perfect place for excursions to the European institutions, as well as for exploring Europe. Based on the positive experience gained in this programme since 2013, the EBS Law Term 2019 will continue to focus on one of the most fascinating areas of international commercial law - the Transnational Commercial Law. Transnational Commercial Law deals with the growing body of internationally unified or harmonized law in areas of particularly high relevance to international commerce. Some of the instruments of transnational commercial law, such as the New York Convention on the Recognition and Enforcement of Arbitral Awards, are extremely successful in global business. Others are pioneer instruments with promising perspectives such as the UNIDROIT Convention of Cape Town on International Interests in Mobile Equipment and its Protocols on Railway Rolling Stock or Space Assets such as satellites. From a methodical viewpoint, Transnational Commercial Law raises the intriguing question of comparative law as to why some instruments are so successful and what can be learned from them for designing other instruments. In addition, creating Transnational Commercial Law instruments requires specific negotiation skills and high-level diplomacy in order to get states to say “yes” to a new instrument. The overall aim of the programme is to provide students with an overview of the most important concepts, methods and general problems of Transnational Commercial Law as well as an introduction to a selection of important instruments of Transnational Commercial Law. The courses are held by law professors and renowned legal practitioners, all working with a particular focus on transnational commercial law. The courses of the program are therefore often divided into blocks of 2 to 4 hours (including breaks). Click here for an enlarged view of the graphic. *All courses offered are subject to changes and depend on a minimum number of participants. The programme consists of a combination of compulsory and elective courses, which are combined in four modules. Through the integration of leading lawyers, EBS Law Term courses are often taught in blocks. A specific course is divided into several sessions and usually lasts between two and four hours (including breaks). Upon successful completion of the course programme, participants receive a certificate of participation. Credit transfer lies within the discretion of the partner institution of EBS Universität. Students are advised to contact their study abroad advisor. Students will be able to earn European Credit Transfer System (ECTS) credits. 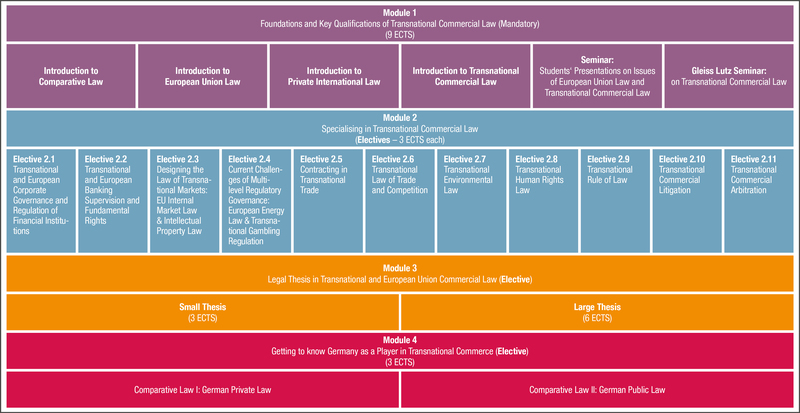 In order to receive the EBS Law School Certificate for successful participation in EBS Law Term 2019 on Transnational Commercial Law, students must successfully participate in Module 1 and a minimum of four electives from Module 2, totaling 21 ECTS credits. Students may choose to earn up to 33 ECTS credits out of the entire EBS Law Term consisting of 48 ECTS credits. 2 ECTS credits equal 1 ABA credit. As credit transfer is the responsibility of the partner institution of EBS Universität, students attending EBS Law Term should establish the minimum workload required by their home universities prior to the programme. The semester ticket covers the area of Wiesbaden, Mainz and Frankfurt. Our Housing Office assists international students to find affordable accommodation close to the campus. All courses are held in English. Students must have a minimum score of at least 90 on the Internet-based Test of English as a Foreign Language (TOEFL). Applicants should have completed at least one-and-a half-years on a full-time undergraduate law programme or at least one year at a graduate law school by the time the programme begins. To apply for the EBS Law Term from September to December the following three steps are required. The exchange coordinator of the home university nominates exchange students through an online nomination system. Nominated exchange students receive an email from EBS International Programmes Office with details on the online application procedure. Please note that it may take 2-3 work days for EBS to process the nominations and mail out the login details to your students. If you do not attend one of our partner universities and you are interested in our Law Term, please get in contact with rita.broschek@ebs.edu. A limited number of spots will be available to visiting students. Applicants must meet the same language and academic requirements as the exchange students. The tuition fee for the Law Term is EUR 5,000. Visiting students will receive the same service as exchange students. Enjoy a great barbecue with other students, professors and staff! Here you can see the EBS Law Term 2016. Experience the beautiful city of Heidelberg like the EBS Law Term 2017. The excursion takes place during the introduction week. Another excursion is waiting for you during the introduction week - a visit of the European Central Bank in Frankfurt. Here you can see the EBS Law Term 2017 in front of the European Central Bank. The excursion to the European Court of Justice in Luxembourg is one of the highlights of the EBS Law Term. Here you can see the EBS Law Term 2016 in the building complex of the European Court of Justice. The farewell event of the EBS Law Term 2016 took place at the international law office Clifford Chance. Get to know a law office first hand and ask all the questions that have been on your mind for a long time!